Researchers from the University of Illinois at Chicago have identified a protein that is crucial for activating inflammation—both the good kind of inflammation that leads to healing wounds and fighting infection, as well as excessive inflammation where the immune system can damage tissues and organs. The protein—an ion channel that spans the membrane of immune cells—presents a new target for the development of drugs that can restrain overblown inflammatory responses. The researchers report their findings in the journal Immunity. "Now that we have identified this crucial channel, it opens up the possibility of developing targeted new anti-inflammatory drugs to modify its function and help and reduce inflammation," said Malik. While some drugs currently exist that target potassium channels, drugs specific to the TWIK2 channel still need to be developed. 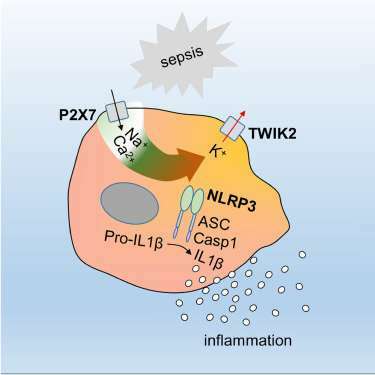 "Knowing that TWIK2 is the channel which leads to activate the inflammasome allows us to dial down the inflammation response with a drug that inhibits TWIK2 when inflammation gets excessive," said Malik. "Some of the fever-suppressing effects of quinine may be due to its effects on the TWIK2 channel," said Dr. Jalees Rehman, an associate professor of medicine and pharmacology in the UIC College of Medicine and a co-author on the paper. "We found that quinine reduced the levels of the inflammatory molecule interleukin 1-beta which is known to cause fever," said Rehman. One of the challenges for treating excessive inflammatory responses is that many anti-inflammatory medications have major side effects. "By discovering new components of the inflammation pathways, we hope to pave the way for new personalized anti-inflammatory drugs which minimize the side effects for patients," Rehman said.